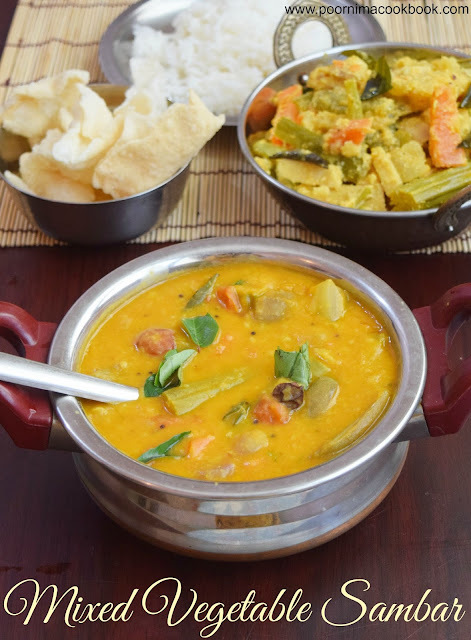 Try this flavorful & tasty Tamilnadu style sambar, which is a best accompaniment for rice, idli / dosa. 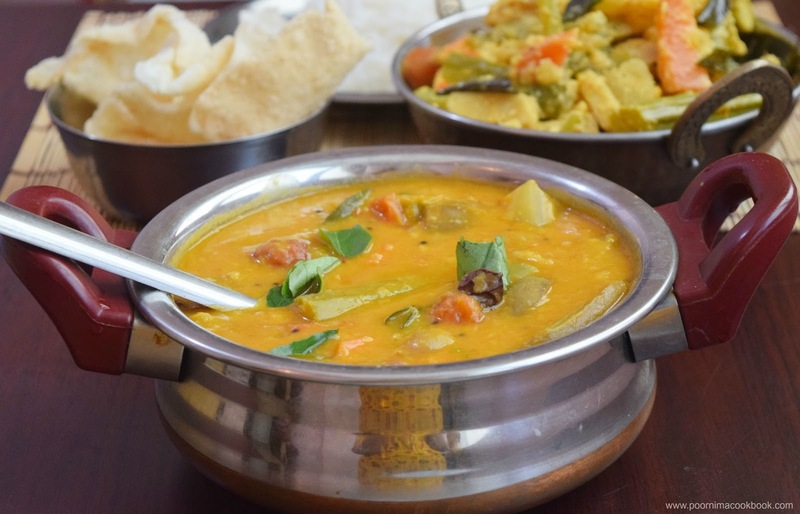 It is prepared using dhal (lentils), vegetables of your choice, sambar powder, tamarind and spices. Normally during festival times, we used to prepare mixed vegetable sambar adding varieties of vegetables. Do try this and give your feedback! Wash the vegetables and cut into pieces. Immerse brinjal in water to avoid discoloration. Soak the tamarind in a cup of water. After sometime squeeze and extract the juice; keep it aside. Wash toor dhal and pressure cook adding water along with turmeric powder and asafoetida till it becomes soft. Once the pressure releases; open the lid and mash with the laddle and keep aside. Heat oil in a kadai and season with mustard seeds; once it splutters add the remaining ingredients 'For Seasoning', one by one. 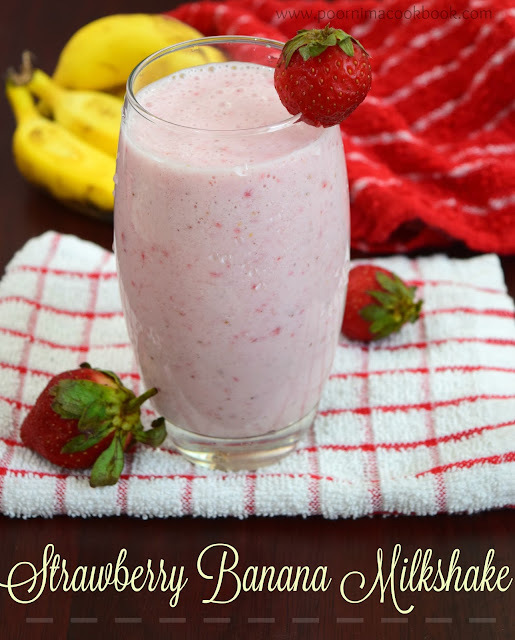 Once it crackles; add chopped onions and tomatoes with little salt; fry till tomatoes become soft. Add the vegetables, fry for a while and add water. Close the pan with the lid and allow to cook till it is half done. Now add the tamarind water, cooked dhal, salt, sambar powder along with a cup of water. Mix and allow to boil. Add asafoetida at last and simmer for five more minutes. Add corriander leaves and switch off the gas. Serve hot with hot rice paired with any poriyal / Veg stir fry. 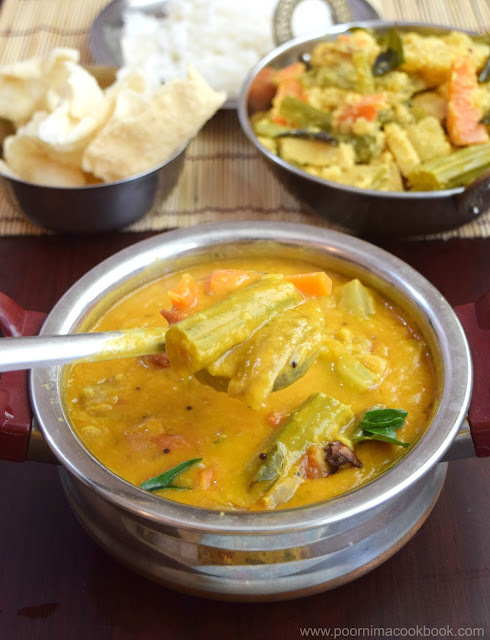 You can also try using radish, broad beans along with this vegetables to prepare this sambar. You may adjust the water quantity and spice level to suit your taste. 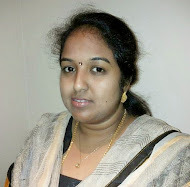 Sambar will tend to thick, so adjust the water level accordingly. Addition of ghee (clarified butter) while serving will enhance the taste and flavour of sambhar.